Here's some pictures of Bill Bedford 2nd generation multiple unit 34mm wheelbase sprung bogies, together with prototypes of 14:1 plastic gearboxes. 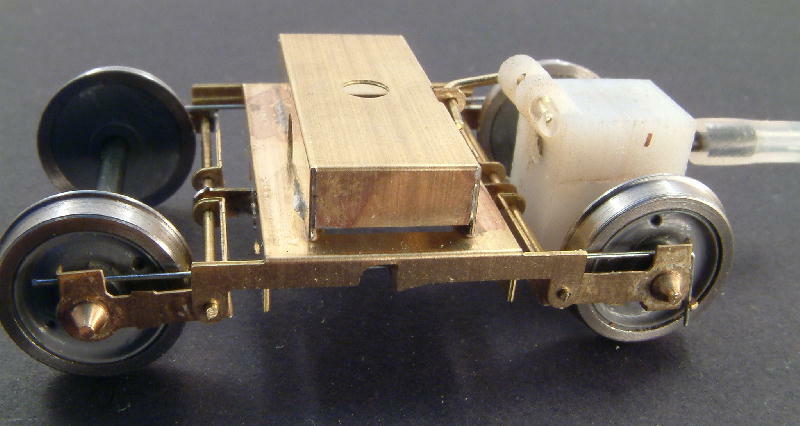 The axles are held in swing arms, rotating on transverse rods. 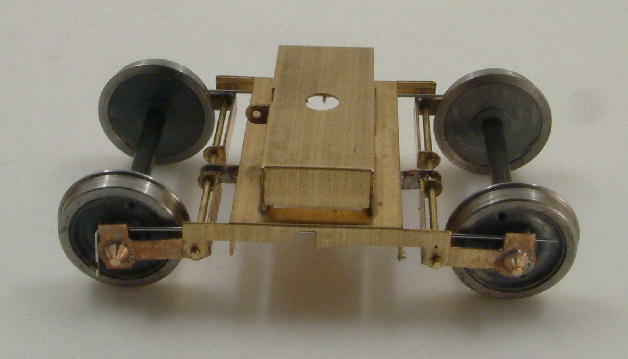 The bogies are designed for use with 2'9" nominal prototype diameter wheels. The ones used in these picture are 10.5mm diameter lowmac wheels (Alan Gibson 4S07). 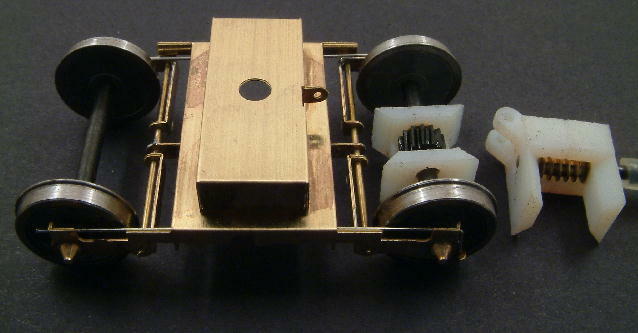 The primary springs fitted to this bogie are 0.33mm (0.013") diameter, but can be changed to suit the springing characteristic desired for the vehicle weight. Secondary springs are not shown in these pictures. 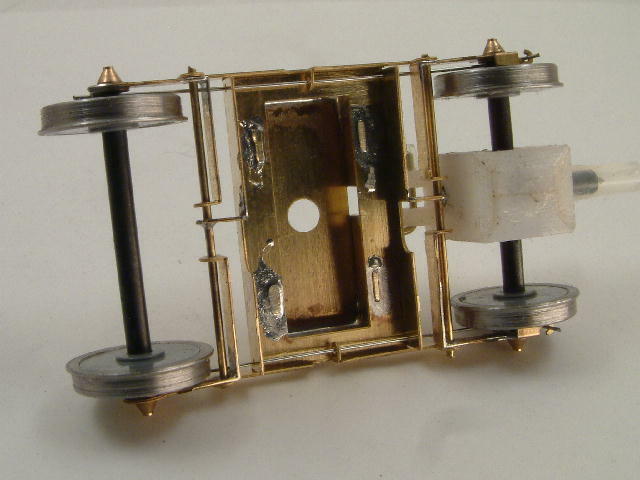 The plastic gearboxes are in moulded in four pieces, assembled (with superglue) in pairs, one pair carrying the transmission shaft, the other carrying the axle. The two pairs are then mated. 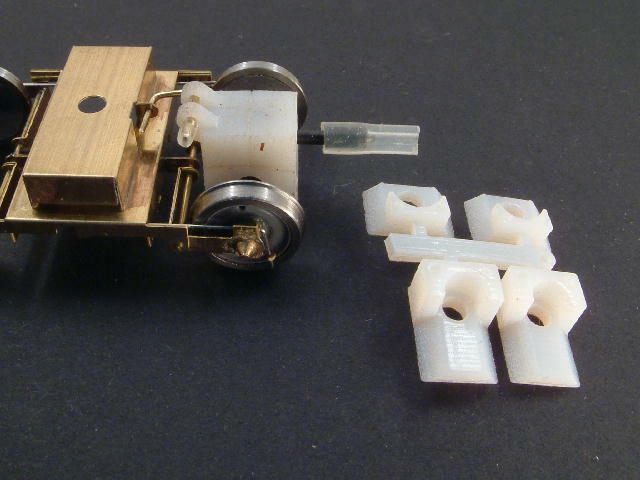 The gearbox has a torque reaction mount. The torque reaction arm is a piece of wire linked to the tag on the bogie top box, with the wire carried in a silicone tube sleeve in the hole of the gearbox reaction mount. The gearboxes use standard Tenshodo 14:1 gears, with the pitch of the transmission axis at the usual 3.6mm above the axle axis. 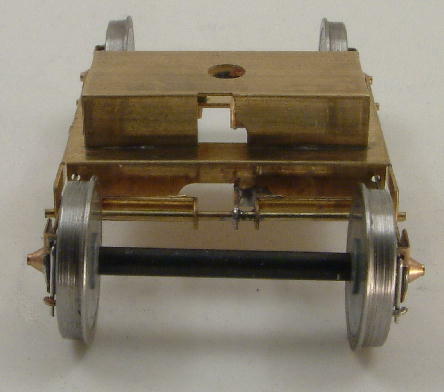 For 10.5mm diameter wheels, as shown here, the transmission axis is therefore approximately 8.9mm above rail height.